I celebrated my 69th birthday recently and have been touched by how many people remembered and called and emailed to wish me. Wonderful to be remembered, especially at an age when many people think you are increasingly irrelevant. It has been the end of a busy and eventful few days, weeks, months, year actually when I think about it. The completion of the five book spiral horn series and, a few days ago, the completion of the biggest book project I have ever attempted – Hunting the African Buffalo – Nature’s Debt Collector – The Six Subspecies – a 480 page, 735 photo monster; a fantastic last hunt in February in Cameroon for my favourite plains game animal, Lord Derby’s eland; and the end of my hunting career such as it has been. So, family, friends and fellow hunters, this is my last Newsletter and Blog Post. I am busy selling my firearms and hunting books, clearing out my hunting cupboard, resigning from many of the hunting associations of which I have been a member and tidying up the rest of my hunting bits and bobs. The Buffalo Book, which will be out in or about September, will be my last hunting book and I will no longer write hunting articles other than for the odd friend who specially requests it and then only after I have given the request some serious thought. I have reduced the print run of the Buffalo Book quite drastically to 1 000 standard editions, 300 limited editions and 30 Deluxe editions because I do not want to be tied to selling hunting books. I will maintain my website and the two Peter Flack Productions online shopping sites for a period of two years but will almost certainly then close them unless something, which is not currently on my radar screen, appears from over the horizon. Obviously, once the websites are closed, I will stop selling books and pulp the remaining ones. Good morning to those of you who have applied for membership of the Fair Chase Guild. Bad news I am afraid. I was informed on Friday 7 April by the president of SA Hunters and Game Conservation Association (SAHGCA) that, at the recent meeting of the 62 branch chairmen of SAHGCA, these chairmen, led by Mr Jan de Man, voted to cancel the association of the Fair Chase Guild with SAHGCA. I was told that the reason put forward for the cancellation was that all 40 000 plus members of SAHGCA were fair chase hunters and they did not need an association to prescribe to them how they should go about it. Just to recapitulate for a moment. I proposed the formation of the Fair Chase Guild under the auspices of SAHGCA some 18 months ago at a meeting at the head office of SAHGCA attended by the president, CEO, Conservation Manager, a board member of SAHGCA and assorted other members and employees of SAHGCA. Thereafter, a number of further meetings took place, also at the head office of SAHGCA, to give effect to this proposal and which culminated in the formal announcement of the formation of the Fair Chase Guild under the auspices of SAHGCA at the official dinner immediately preceding their Annual General Meeting in November 2016. Clearly, therefore, the decision taken by the branch chairmen is questionable from a legal standpoint – how can they summarily undo such a decision of SAHGCA’s? But that, I guess, is for SAHGCA to sort out. No-one is compelled to join the Fair Chase Guild and the Guild has neither the authority nor wishes to prescribe anything to anyone, as has been stressed by the Guild in writing more than once. It is an entirely voluntary body for like-minded individuals and organisations who wish to conduct a public relations strategy designed to promote fair chase hunting. As such, there must be other reasons behind the decision of the branch chairmen. When I pushed for the real answer, I was told that this was “Boere (Afrikaner) politics” at work, whatever that may mean. Still later, I was told that a number of those most vociferously opposed to the Guild were those who shot game from vehicles (bakkie ‘hunters’) and they objected to an association which frowned on this behaviour. The decision has taken me completely by surprise as I received no warning that the Fair Chase Guild was even on the agenda of this meeting and, I confess, has left me feeling perplexed, confused and not a little upset. It is worrying that I was ignorant of what a large number of SAHGCA branch chairmen think is the right and proper way to hunt, on the one hand, and that they did not want hunting promoted, on the other hand, or certainly not by the Guild. Whatever the real reasons for and whatever the legality of the decision may be – and there were a number of chairmen who, after the meeting, apparently expressed opposition to the decision although not saying so in the meeting – the decision of the branch chairmen is clearly a vote of no confidence in the Fair Chase Guild and its aims and, as the original proponent, in me personally. Looking back over the brief six months that the Guild has been an association of SAHGCA, I can honestly say that they have been neither a hindrance nor a help and the Guild does not need the association with SAHGCA to move forward, other than that it will no longer have access to the membership of SAHGCA, many of whom (it was thought) would be keen to join the Guild. How wrong this latter view was. The question clearly is this, however, if the original proponents were so wrong about the appeal of the Guild to SAHGCA members, is there any point in going forward alone? Gerhard Verdoorn, the current president of SAHGCA and one of the original founder members of the Fair Chase Guild, has decided to remain on as president of SAHGCA for the remainder of his 18 month term and is still keen to continue to develop and grow the Guild as an independent body. To do this will mean that, at the very least, the Guild will have to develop its own constitution, its own membership certificates and open its own bank account. Gerhard has agreed to complete the design of the membership certificate which he has started, his wife, who is a lawyer, has offered to investigate what will be required to open a bank account in the name of the Guild and I originally offered to redraft the membership forms and attempt a first draft of a new constitution. In the sober light of day, however, I have asked myself three questions, firstly, can I stay on as an honorary life member of SAHGCA given my close ties to the formation of the Guild; secondly, is it worth pursuing the development of the Guild at all; and, thirdly, how does this affect me personally? In moments like these, I often think of the character in Dante’s Inferno who was condemned to push a boulder up a hill only to find that, when he reached the crest, the boulder slipped from his grasp, rolled all the way down and he had to start all over again. I do not want to be a boulder roller! I have made my decision. I have resigned from SAHGCA. I will not pursue the goals of the Fair Chase Guild. I will not play an active role in any hunting association. I will stop hunting and become a non-hunter. I have often felt that, in life, it was important to recognize when doors were opening and closing for you. To walk through the ones that were opening and not into the ones that were closing. For some time I have known that the hunting door was closing in my life but, because it was such an important one to me, I persisted in pushing at the closing door to keep it open. No more. I must accept that, for whatever reason, my time as a hunter has come to an end and move on with the rest of my life, however long that may be. I am very sorry if this will disappoint anyone or, worse still, make them angry at me but I cannot see any alternative. Fortunately or unfortunately, I have never learnt how to run with the foxes and hunt with the hounds. For those of you who still want to pursue membership in the Guild and its goals, please feel free to contact Gerhard Verdoorn – nesher@tiscali.co.za. I have since had the matter explained to me by a lawyer active in SAHGCA circles. He said that those at the forefront of the move to cancel the Fair Chase Guild’s association with SAHGCA, despite professing to be ethical hunters, do not comply with the Fair Chase Guild’s Code of Conduct. They are worried that, if they join the Guild, they will be found out or exposed by their “friends” who know what they do. If they do not join the Guild, on the other hand, they are worried people will say that the reason for their refusal is because they are unethical and do not comply with the Guild’s Code of Conduct. In other words, they are damned if they do and damned if they don’t. The Guild represented a threat to them and they had to find a way to put a stop to its activities. All the rest is window dressing. The Code of Conduct, for example, which apparently became such a bone of contention for these opponents to the Guild is based, almost word for word, on that of Rowland Ward’s Guild of Field Sportsmen, which has been in existence for decades and was drafted by the Chairman of Rowland Ward at the time, Robin Halse and his friend Chappy Scott. The voting mechanism suggested for the Fair Chase Guild, which also caused such hysteria in the ranks of these opponents, is the same as for the Special Rates Areas in the country, i.e. one vote for every rand contributed, although in the Guild’s case, non monetary contributions were also taken into account and the voting system was both open to debate and amendment by members. Clearly, these opponents were determined to find fault with the Guild regardless and, in the end, after extensive lobbying, managed to do just that. But let me return to the closing door. What gave my push back added impetus was the Cecil debacle when I realized there was not one hunting association worldwide that had a public relations strategy worthy of the name. As a hunter I was embarrassed, no, humiliated by the pathetic responses of the bodies to which I belonged and which I thought should be at the forefront of proactively representing us and promoting the critical role that hunting played in conservation. In my arrogance, I resolved to try and change things and I have failed. I have learnt, yet again, the truth of the old maxim: You can take a horse to water but you can’t make it drink. Secondly, those who have read my recent books and, particularly, the Conclusions, will also have noted my growing despondency at the failure of almost every African government to recognize that, if they only used their wildlife and wildlife habitats sustainably, they could provide opportunities for all their people in perpetuity and thereby conserve both the wildlife and its habitats. But no, the politicians, army and police personnel who should be at the forefront of these efforts are the very ones leading this short sighted destruction and for the basest reasons. To this must be added my disappointment that people in South Africa, who call themselves hunters, can be equally short sighted and also for base reasons. Both groups would rather jeopardise the future ability of their children and grandchildren to enjoy these wonderful, renewable natural resources than change their ways, which they know in their heart of hearts to be wrong. And here I am obviously not just talking about the opponents of the Fair Chase Guild but also those who offer canned killings, domesticate and/or genetically modify wildlife to produce unnatural colour variants and the like. I do not want to inhabit this kind of hunting world any longer and so, instead of tilting at windmills and continuing to push in where I am not wanted; instead of seeing my energies gradually dribble away and, ultimately, founder to a futile halt, I want to redirect my energies, such as they are, into other and different channels. I hope you will not be angry with me or take me to task for abandoning the good fight but I think it is now time for younger, braver, better men and women to either step up or continue the good fight. Totsiens! Well I’m off to Lokomo in Cameroon soon to start my first season there, After hunting and guiding since 1990 I feel privileged that I have never given way to the corrupt and unethical, like you, hunting is my passion, a passion for the great outdoors and the game that we follow, Financial reward played a part but not the driver. A quick thank you to you, and guys like you, for all your efforts over the years, to impart the spirit of the hunt. There are so many people out there that confuse hunting with culling and wildlife management, taking delight in shooting from vehicles and planes. Your steadfast stance and your commitment to what you believe in is an inspiration to those of us who might at times might be tempted to falter. When I was a young PH, newly licensed in Zimbabwe, and under pressure guiding bombastic wealthy clients who new no different nor cared, I cut corners on occasion for reward, now older and nearly 30 years on, my resolve to pursue fair chase is unchallenged. no gratuity nor personality can tempt me. Lastly, the anti-hunting lobby has brought to an end an era in Tanzania that I fear will have far reaching consequences for hunting in general and Africa specifically, the wild areas in Tanzania will feel the effect of their lobbying in the next few years, already the President of Tanzania has plans afoot (recently reported in the local Tz news papers) to re-allocate hunting areas not used to peasant farmers. THE END. Thank you for your honest comments and very kind words, Peter. I too am one of those who has learnt by my mistakes. I am certainly not one of those who can say that, if I had my time over again, I would do things exactly the same. Quite simply, I have made far too many mistakes for that. On the other hand, there is nothing wrong with learning from your mistakes unless you keep on repeating them, although I have done that as well. I really like your comment that, “We must return to our original purposes of hunting to be seen as good stewards of our lands and wildlife.” As I have often said, my passion is wildlife and wildlife habitats and I support whatever conserves them and oppose whatever does not! Please forgive the familiarity , I hope that you will understand my use of it as you read this , though we have never met in person. I feel that I have known you for years, hence the salutation. To start, I am 61 and so not at all a novice to life and its vagaries. I am a physician in full practice in a small town in a very rural area for 35 years, with 8 children, 2 sons of whom hunt. We live in the remote Upper Peninsula of Michigan. It was with dismay that I found this accidentally, I found it when I was moved to look you up on the internet, while finishing reading one of your books for the 4th time. Yes, the fourth time. I basically have all of your books, including the recent spiral horn series numbered and signed. I first started hunting in Africa in 2007 , with now 4 trips to Namibia and I hope for more trips in the future. A major motivator for this big commitment was your writing. I am very widely and deeply read , and to find a writer who embraced ethical hunting , conservation, and who was intelligent . literate, and I dare say erudite was a major motivator to me doing this. You had that effect. Your passion, meticulous approach, detailed and interesting story telling, and deeply caring insights were an epiphany for me. Hunting was clearly your life in all of the right ways, and you were able to beautifully communicate that in your writing. We as we age are inevitably faced with very difficult to assimilate realities . I use that word instead of truths deliberately. I have spent an entire career trying to make my community, my health system, and most importantly my patients the focus of my efforts to help, improve, serve, and care for. Recent major blows in health care in the US have resulted in huge changes nationally and locally with some of that being degradation and some of that being change harder to characterize. Important things that I have worked for my entire career have been undone. They say that change is the only constant, but all change is not better. Yet , in the end, if we believe that there is Something of Value ( as another writer of Africana opined ) in what we do and what we believe, then it is worth clinging to and fighting for. We never know what effect our words and actions will have, including long after those words and actions and indeed our lives here on Earth end. I see that all of the time with patients. If we are very fortunate, we leave a legacy. Your community is not just where you live in RSA, but the entire hunting community now and in the future, and even more importantly the entire community that believes passionately in wide spaces and our natural environment. Without those willing to Fight the Good Fight, there is no hope for anything of value, morals, ethics, anything. Your books are a major legacy and an inspiration. From my standpoint, you have had a huge effect. Look at the state of southern Africa in the 1960’s and compare to now. I fully realize that I was not there, but sometimes seeing from a distance can give a bigger picture. Everything that I have read states that it is vastly better for wildlife, mainly because of hunting. Of course it is not perfect, nothing is. You have been a huge voice of that, and just because other areas are far behind that and major challenges continue as obstacles does not mean that we should give up, rather we should fight harder. There is much to save and much to teach our children. When you decide to become an author and appeal to a wide audience, you actually become a part of each and every one of your reading fan base. Rather like a member of the family, and this truth that you took on perhaps unknowingly also carries a responsibility. When you announce that you are giving it all up , the hunting, the mementos, the lifestyle, the dedication, it comes across to all of those who know you now through your writing and all of those who will discover you in the future by picking up one of your marvelous passionate books, as essentially a repudiation of the values that you so strongly espouse. It diminishes something that is very , very valuable. Inevitably, we face defeats in life. I cannot fully understand those that you refer to, but perhaps you have allowed those disappointments to wrongly overwhelm you. I too have had to fight embitterment, it is a very nasty cesspool that it is very easy to swim in. In my mind and I suggest in the mind of your large current and future readership you rise far above those petty people and events , your writing made all the stronger by your passionate embrace of such important causes which are not lessened by those greedy and uncaring individuals but made that much more important. I think that you do not realize just how important your voice and actions have been, are, and will be. There is much more that I would say, and probably more eloquently, in person over a fine South African wine. I am sorry if this is both long winded and seen as offensive in any way. I was moved to communicate to you because you moved me through your writing. I too worry about the degradation of my senses and abilities as I age, but that is inevitable if I make it that far, whether hunting or anything else. A mark of our success in this short life is our ability to accept that with grace , a very difficult thing (Hemingway could not accomplish it ). I do hope that I will hunt and fish to the end, and I recognize that if I live long enough, that it won’t be a many mile walk at that point but if I am lucky, a son or friend having the patience to take me out and sit down in a wild place and have the opportunity to pull the trigger or not. It will be being there and with people who will carry on after I am gone that will be my mark of success and appreciating all that that means. Perhaps I will be left with looking at trophies on my walls each steeped in marvelous memories, and looking at picture albums with my sons, two of whom I brought to Namibia and who loved every millisecond of the experience. If so, then I hope to accept that gracefully, and that they take their children hunting, hopefully in beautiful Africa. I would wish that you still stay involved, that you take a hunt here or there, that you walk in the bushveld, that you write some more, that you teach more youngsters all of those values that you so eloquently described in your books in scenarios where you did exactly that . I also wish you a very happy retirement. And I cannot help myself, I do wish to purchase your book on buffalo—how do I do that? We are a rare breed it seems now a days. I’m afraid I’m a bit stunned at the moment…..almost as if I had just stumbled across an obit of a dear friend in the paper quite by accident. Although I can accept your motivations and feelings and have great empathy, I would humbly urge you to pull over and take a breather before doing anything as dramatic as selling your guns and quitting hunting. After all, what would Bertha do? the old girl has been everywhere with you. You have done so many wonderful things for the hunting community, not the least was the “Guild”. We as hunters do need to talk about these things and you were our conscience. After all, anyone would be burned out if they just finished five books on spiral horns and then a 500 pager on buffalo. I was more than frustrated about the Cecil thing too, but I have chosen to work with an organization that is focused on fighting back. Granted, I may end up in the same place you are now, but I will stay an fight on for those that are coming after us. Frankly, it will be fascinating to see what and where you show up next as you have far too much energy, curiosity, and intelligence to start collecting stamps. 1 Physical – We all have to stop hunting some time. I do not want to leave it too late to a time when I start wounding the wildlife I care so much about. I do not want to leave too late to when I can no longer walk and stalk the five to ten hours a day I typically walk on the hunts I enjoy the most. I do not want to wait until I can no longer see the game as soon as it is pointed out to me. I have been hunting for 60 years and feel blessed to have been given this amount of active time in the hunting fields of Africa. 2 Mental – Gradually, my hunts became adventures. Trips I went on to see where the old hunters, explorers, naturalists had been. To see what they had seen. To meet who they had met and to hunt what they had hunted and I have been blessed to hunt in 20 African countries for all the wildlife I have wanted to hunt. For the last four years I have essentially been returning to the places I liked to hunt for the animals I most likes hunting but there has been very little new and I think my head has wearied before my body. Plus going to these destinations has become increasingly unpleasant as bribery, corruption and incompetence has grown ever greater and, in some instances, into the very fabric of the societies – the way they habitually do things there. 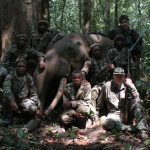 3 Organisations – I have grown progressively disillusioned with most of the organisations which operate in the hunting and conservation spheres. I am in the sixth and last of the hunting phases and, despite wanting to give back to both hunting and conservation, which have defined my life for so long, simply cannot find an organization behind which I can wholeheartedly throw my weight, such as it is. I have tried but. as the Fair Chase Guild has shown me, even the very best and most honourable motives are no defence against petty politics and downright dishonesty. 4 Alternatives – As I head into my 70th year, I am conscious of Father Time’s clock ticking ever louder in my head and I want to spend whatever time remains to me doing things I like as opposed to those I do not. The hunting sphere has increasingly been an unpleasant one for me for a combination of the reasons expressed above and so I would like to do more of something I like a lot and that is to write but about things other than hunting and related topics. For better or for worse, I have never been able to do things by halves and I would find it almost impossible to become an occasional hunter who occasionally goes out and occasionally wounds game. I would much prefer to try and become a full time writer and try and write one or two meaningful things. I can understand your frustration, but the good fight needs to go on. Really hope that in time to come, you will find some way to still support the war against the anti-hunting cabaal. Thank you for your your tremendous contributions to the world of hunting over all the years. It will not be forgotten and was most definitely not in vain. I have never learned how to run with the foxes and hunt with the hounds. How true your words are Peter. At age 73 I made the decision you are making myself. Hunting is not how I remember it also. I’ve gone to other pursuits that seem more in line with my thinking and emotions. I wish you the very best my friend. You have left us a legacy few folks can equal. Thank you. Obviously I am saddened by this turn of events but not by your decision. You are man of integrity and faith. When doors close, they close, leading us to new stages of life. I have great expectation of your next stage and what will unfold. I went through a similar experience in the past, when dreams/goals were dashed by those that have no real sense of what hunting/conservation truly is and why we love this. In summary, I surveyed about 200 different conservation groups in the US and abroad and found that the large majority (all but maybe 15) were more focused on making money than in doing any true conservation/education/pro-hunting work. I was appalled. I then started my own groups. I shut one down when the mission was accomplished. The other is still running but not in the direction I had hoped. One other eye opener for me was that three very prominent US based groups were located in the same offices/buildings/address in South Carolina. I investigated further and found they were run by the same staff, just different “groups”. The goal was to raise money, pay themselves, send out elaborate newsletters and magazines and then do nothing. This reminded of Bernie Maddoff and his scandal in the financial world a few years ago. This goes on today in my forms in our “industry”. I was also shocked at the lack of “spine” in the hunting industry response to the Cecil escapade. You and I discussed this and I agree that the public relations efforts by all of the groups (SCI, DSC and many others) was woefully lacking. In a word, it was lame and pathetic. I have no answer how to answer or even launch a counter campaign to tell the actual truth. It seems that the media and even many in the hunting business have no stomach for the truth. As Pontius Pilate once said, “What is truth?”, when he was confronted by Jesus Christ with the greatest truth ever presented a man. We just don’t get it and I believe that most see only what is in front of them with a focus on “how do I get my piece of the pie or all of the pie and the heck with everyone else”. I see that in my business and it is disheartening. The reality, at least from my perspective, is that we take the gifts we have been given by the Lord and toss them in the rubbish and then ask for more. We do not appreciate or even “steward” most of what we have. If someone has “more” , we want that as well. The nature of men is rooted in selfish pride (sin) and not in a God larger than what we can see or control. I am discouraged, but not defeated. You have fought the fight, you have taken blows to body and spirit, you have finished the race in front of you. Time for better things and things in your future. I salute you and admire you. Press on! I am very proud to call you my father. As much as I hunt with a camera and not a rifle, I have always thought that you have done your very best to represent everything right and noble in the field of hunting. Your love for Africa’s wildlife and its wide open spaces and your desire to conserve them has been unquestionable. I have admired your passion and the actions you have taken to try and achieve this, and have absolutely no doubt that you have positively influenced many and that through your stories and conversations will continue to do so. You leave behind a very rich and remarkable legacy. Thank you for letting me share in your passion! I have so many great memories and experiences to cherish; from my first training sessions on the range (I still remember falling over when I first shot your 7mm), to the first reedbuck I ever shot on Bankfontein, to some amazing trips with you in Africa. Thank you! As one amazing chapter closes another opens. Thank you my Son. It is the greatest blessing in life when your children decide they want to be friends with you after they have left home. Thank you for your kind and loving note. You make me proud to be your Dad and I cannot tell you how your remarks have touched my heart. Coming from you they mean so much to me. That hunting has played a role in our love and friendship for one another has been another great blessing and, like you, I have a collection of wonderful memories filed away on my internal hard drive: the bushbaby screeching overhead in Zimbabwe; the lake at Murulle Camp in Ethiopia where you went fishing; and birding with you in Cameroon to mention but a few. And, of course, I pass the photo of you with your mountain reedbuck every morning en route to my desk. What incredible memories! You once endorsed in a book for me with a few simple lines and I return them to you now. Very sorry to hear of your decision, but it is yours to make and I wish you well in the future. Hope you will be in Dallas in 2018. Thank you for all your contributions to the hunting world. If has been a pleasure to have met and talked with you both in South Africa and in the United States. I have read most of your books on hunting and find them very interesting and informative. I have hunted all over Africa since 1999 and have taken some grand trophies over those years. I agree with you that things are changing and not always for the best. Africa is a beautiful country, but I see it going down the road of destruction. The destruction with guestionable organizations and the way the government is running the country. There is know wonder people such as yourself get tired. The constant shoveling of sand against the waves. I would like to wish you a belated happy birthday and many more to come. Maybe some time in the future our trails will cross again. I don’t know you personally, but surely quite well from your wonderful books and other articles you have produced over the years. Thank you for that, it was and is always something that I will carry with me as being a fellow hunter of yours, with sensible ethics and huge respect for wildlife and the sustainable utilization thereof, in the conservation of this huge wealth, we are fortunate to enjoy. I urge you not to stop this wonderful part of your life, do keep on enjoying your future hunts (although scaled down) in the way you know it should be done. “Before you diagnose yourself with depression or low self-esteem, first make sure that you are not, in fact, just surrounded by assholes.” – Sigmund Freud. I wish you and your family everything of the best at the beginning of the rest of your lives. Peter, So sorry to read that you no longer will be doing your blog. No one in the hunting/conservation world has done more than you have to preserve the activities that we enjoy. I have all of your Spiral Horn books and will buy your new book on Buffalo when it is published. Please make sure you will save me a copy. I will be coming to Dallas in January. I hope that you will be there as I will bring the Bongo/Nyala book for you to sign. Please keep in touch. I understand your decision fully Peter. You have had an amazing hunting life …. things have changed now. Now time to relax and enjoy other things of priority. Good luck. How do I get a copy of your new book. Ek dink dat die jagtersgemeenskap dalk moet besin oor hoe ons iemand soos jouself so kan vervreem dat jy die besluit neem om dit wat jou lewenslange essensie was vaarwel toe te roep. I am saddened to read your latest blog but can understand your reasoning. Your first book, “Heart of an African Hunter” was the first hunting book that I bought and read, other than the occasional Magnum Magazine. It was the inspiration that lead to my own fairly extensive and on-going hunting experiences, as well writing my own article or two and building up my own book collection that now numbers well over 300 titles. .
What I liked the most about your writings was the sense of good ethical conduct that you tried to instill in all your readers. For the record, I took on those values and instilled them in my own son, as well as the many youngsters that I introduced to the wonderful world of hunting and the great outdoors. You should know that your words did indeed influence very many people in the positive way that you intended. Your fight for what is right has not been without success. Maybe you just do not know how many people actually agree with your sentiments and opinions. I also know that probably 60% of all animals “harvested” in RSA are shot off the back of bakkies. And these folk call themselves hunters, which grates me no end. That is what you are up against. The likes of SA Hunter do not want to affront these “hunters”, as they are the biggest source of income for their organisations. For what it’s worth, I will continue to follow your example and hope to instill the right ethical values in all my hunting companions. Good luck with whatever plans you have for your future, and I wish you good health and many years of happiness to come. . Thank you for everything you have done, and stood for, in the hunting world. As a hunter, I am deeply saddened by the personal price you had to pay that led to your decision. Be assured, you left us all a legacy that shall endure. As we are richer because of you, we will be poorer without you. I respect your decision, and (ever the high) way you took and convey it to us. I wish you all the very best. I particularly wish the disenchantment you are still feeling to rapidly fade and that you’ll enjoy deep, unremitting and unblemished pleasure in what you have experienced, achieved and promoted with distinction. And because of who you are, I believe you will. God’s blessing on you and your family.